If you are familiar with this site, you’ve probably seen me exercising outside. As much as I enjoy lifting heavy weights, I also enjoy changing my scenery on occasion by challenging myself outdoors. There’s something about struggling to lift a piece of nature that adds a sense of realness and rawness that’s unique from any gym experience. No matter what anyone does in the gym, nature is quick to remind us that we could always be stronger. Although it was several years ago, I vividly recall the first time I deadlifted over 600 pounds. It took me a long time to achieve that goal and I felt on top of the world when I completed the lift. For some reason, pulling 605 pounds felt so much different (mentally) from when I pulled 595. I had finally achieved the numeric goal that had eluded me for so long. Unfortunately, that feeling of dominance didn’t last long. Shortly after achieving my goal, I decided to take a break from heavy barbells. It had been my longest stretch of barbell training ever so I was eager to mix things up. Logic told me that it was a good time to shift gears back towards odd object training. I was already well versed in lifting stones, logs, and sandbags, but now I was a 600 pound deadlifter. That had to count for something, right? Foolishly, I assumed that my newfound barbell strength would make the awkward objects fly up with ease. That thought faded instantly however after wrapping my hands around a huge log that I found in the woods. My initial attempt at hoisting the log up was a colossal failure. Within a matter of seconds, Mother Nature had served up a hearty dose of humble pie. Although it’s been several years since that log humbled me in the woods, it wasn’t the first or last object to leave me feeling incapable. The stone pictured above recently brought about similar feelings after coming across it while digging up my water well in search of a leak. The stone is challenging enough on its own, but even more so when stuck in the wet mud. It took every ounce of strength I had to pull it from the ground. I don’t recall how long it took to remove the stone from the hole, but let’s just say it didn’t go up on the first attempt. Prying it out of the mud, and then lifting it from a water filled hole wasn’t my idea of a good time. I’m still grateful for the experience though as I came away with a free stone that will challenge me for years to come. At this point, you are probably wondering why I get so excited about being humbled by nature. What is so great about struggling to lift a large stone or log from the ground? There are a few ways to answer that question. One would be to focus on the physical benefits of odd object training. For instance, large stones are heavy, difficult to grip, and unbalanced. Lifting a stone is entirely different from lifting a carefully constructed weight that is intended for exercise. With that in mind, there are certainly unique benefits associated with odd object training. Such benefits have been discussed several times throughout this blog’s history however. Regular visitors to the site have already read about the real world strength that’s derived from odd object training. Therefore, I’ll use this entry to discuss another unique benefit. Whenever I’m seen lifting or carrying an odd object, it’s inevitable that someone will ask what it weighs. I never have an accurate answer though. I don’t have the type of scale that’s necessary to weigh them. Ironically, I actually prefer to lift objects without knowing their weight. The fitness industry is already filled with an abundance of egos. 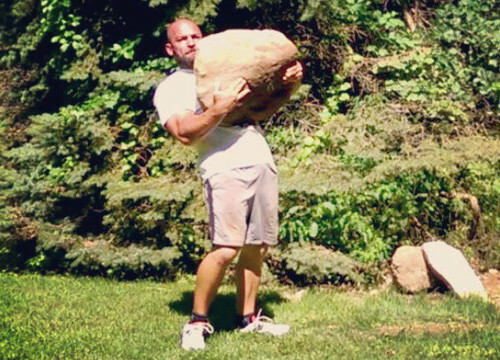 It’s nice to just grab a large stone or log without worrying whether you are lifting as much as the next person. In other words, who cares what it weighs as long as it is heavy enough to challenge you. When you lift a stone or log, you are lifting a unique object that no one else has. Time isn’t wasted wondering how you stack up against the rest of the world. Instead, it’s just you against yourself. And no matter how strong you are, it’s only a matter of time before that awkward object takes over. Thus, each time you lift or carry the object, you are working solely to become a better version of yourself. No one (including Mother Nature) cares how strong you are. It is inevitable that you will be humbled, but you’ll also come out stronger. You won’t need a pound or kilogram stamp to confirm that you’ve become better at lifting or carrying the awkward object. Speaking as a coach who trains athletes for a living, I’m as competitive as anyone you will ever find. Yet, despite my competitive nature, I’m a firm believer in staying grounded. I share that belief for myself as well as my athletes. If you come to train here, it’s understood that you’ll eventually be humbled. Everyone gets an occasional dose of humble pie. Oddly enough, odd object training aligns perfectly with this approach. 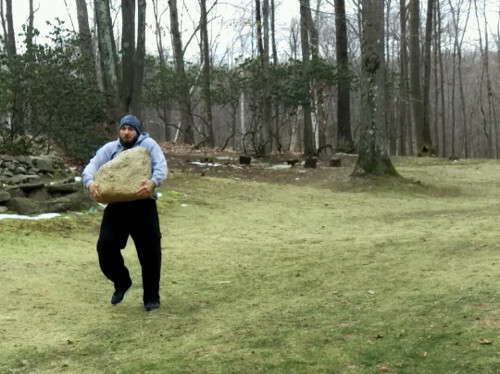 There’s something about struggling to lift an awkward stone or log that brings an athlete back to reality. No matter how big or bad you think you are, Mother Nature is quick to remind you that there’s always room for improvement. In summary, life is too short to waste it constantly comparing yourself to others. If you want to become more successful, focus your time and attention towards becoming a better version of yourself. Worrying about what someone else can or can’t do is irrelevant to your own personal growth. Instead, wrap your hands around a large stone or log and do the best that you can with it. You’ll eventually come out stronger. You’ll also realize that your true competition is seen in the mirror each day. An excellent article on the fact that you always have to start over when you learn a new skill! I will have to try lifting big stones to see how challenging it is. Because of reading this blog, I have an arsenal of stones in a secret place in my village. Very different sizes and weights: to warm up, carry and launch with one or two hands. It’s challenging and satisfactory to train with them. Also, what you said about not quantify what you lift, I apply it also when I run (and cardio) without clock. Only my shoes and nothing else. Rocky Marciano use to train with big rocks and throw them. It worked for him. After your break from barbells and some daunting Mother Nature training, did you go back to barbells and find your strength hadn’t diminished much? In other words, although you found your barbell strength didn’t translate to odd-object strength, did you find your odd-object strength did translate to barbell strength? Or were there issues going in both directions? Personally, I’ve found that specificity becomes an issue once I reach a certain point. For example, I’m always comfortable in the lower 500 pound area, but inching closer to 600 requires more specific work. In other words, there is carry over to an extent (both directions). That carry over will only take one so far however. 600 pounds? The heaviest I could lift is just around 300 pounds. I think that would be too much for me. Great article Ross! We had a group workout ourselves the other week that included stones, along with a few other odd objects and strongman related gear. Definitely felt new to say the least! Excellent post Ross. It seems it is becoming more common that people are seeking ways to train naturally(maybe I’m just looking more). In line with that what is your opinion on the work Ido Portal does with regards to body movement and how natural that is for us? Is it something you have ever practiced? He’s definitely skilled with what he does, but I don’t personally get into those movement flows. I prefer for the “flows” to be specific to our sport (i.e. slipping two punches and coming back with a crisp combination). Ross, you’ve inspired me and shaped my training from day one. Its articles like this that continue to inspire me to new heights. Thanks Phil! Keep up the great work! First time visiting your site, Ross. I am so glad that it is here, and that the ethos behind it is personal and useful. The idea of using odd objects to train is a great one, and one I’d like to explore more. The most I’ve done in this regard is to sling a heavy bag over my shoulder for lunge walks. Nature truly does have a way of challenging. Thanks for your thoughts and advice. I’ve really been enjoying your articles on training outdoors. Please keep ’em coming.